The Toyota Hilux (also stylized as HiLux and historically as Hi-Lux) is a series of light commercial vehicles produced and marketed by the Japanese automobile manufacturer Toyota. The majority of these vehicles were sold as pickup truck or cab chassis variants although they could be configured in a variety of body styles. Most countries used the Hilux name for the entire life of the series but in North America, the Hilux name was retired in 1976 in favor of Truck, Pickup Truck, or Compact Truck. In North America the popular option package, the SR5 (Sport Rally 5-Speed), was colloquially used as a model name for the truck, even though the option package was also used on other Toyota models like the 1972 to 1979 Corolla. In 1984, the Toyota Trekker, the camper version of the Hilux, was renamed as the 4Runner in Australia and North America, and as the Hilux Surf in Japan. In 1995, Toyota introduced a new pickup model, the Tacoma in North America, thus discontinuing the Hilux/Pickup. The 4Runner is now a full SUV, and the more recent models of the Hilux are separate in appearance from the Tacoma. The Hilux started production in March 1968 as the RN10 in short-wheelbase form with a 1.5 L inline-4 engine, generating a maximum power output of 77 PS (57 kW; 76 hp) in Japanese market specification. In Japan it was available at the Toyota Japan dealership retail chains called Toyota Store and Toyopet Store. The modification to the engine was enough for a claimed top speed of 130 km/h (81 mph). The 1.5-litre engine was upgraded to a 1.6 L inline-four engine in February 1971. In April 1969, a long-wheelbase version was added to the range. The short-wheelbase version also continued in production for many more years. The long-wheelbase version was not sold in the North American market until 1972, allowing the Datsun Truck to maintain a strong market presence. The Hilux was offered as a replacement to the Toyota Crown, Toyota Corona, and Toyota Corona Mark II based pickup trucks in Japan, as the Crown, Corona, and Corona Mark II were repositioned as passenger sedans. In spite of the name "Hilux", it was a luxury vehicle only when compared to the Stout. The Hilux was engineered and assembled by Hino Motors to replace the earlier vehicle that the Hilux was derived from, called the Briska in the niche beneath the larger and older Stout – it replaced the Stout fully in some markets. For the North American market, the only body style was a regular cab short bed and all were rear-wheel drive. It used a typical truck setup of A-arms and coil springs in front and a live axle with leaf springs in back. A four-speed manual transmission was standard. In May 1972, the 1973 model year Hilux was introduced designated as the RN20. Nicknamed the "ロケハイ　(RokeHi) a Portmanteau of Rocket Hilux", a more comfortable interior was specified along with exterior updates. A 2.25 m (7.4 ft) "long bed" was an option for the first time in North American markets, although such a version had been available worldwide since April 1969. This received the "RN25" chassis code. The 2.0 liter 18R engine was available in Japan as well, with a three-speed automatic transmission available as an option. The 2.0-litre automatic only managed a 136.1 km/h (84.6 mph) top speed in a road test conducted in Period, South Africa, in spite of a claimed 89 kW (121 PS; 119 hp). The Hilux was radically redesigned in 1975 to be larger and with increased standard equipment. In North America, the new version also meant the introduction of the considerably larger (2.2 L) 20R engine and the SR5 upscale trim package. A five-speed manual transmission became optional. In North America, the Hilux name was fully phased out in favour of "Truck" by that year, having been dropped from brochures and advertising campaigns, starting in 1973. Some North American motor-coach manufacturers began building Toyota motor-homes from the Hilux. The redesigned Hilux was introduced in August 1978, with a 4WD variant introduced in January 1979. The 4WD variant – not offered with any engines smaller than the two-litre "18R" – featured some common technology with the larger Toyota Land Cruiser. Production of the four-wheel drive models stopped in July 1983, but some 2WD variations continued production in parallel with the next generation models. The L series diesel engine was offered on the 2WD variants from September 1979 and the 4WD variants in March 1983. In Japan, the Hilux was joined with the all new Toyota MasterAce, sharing load carrying duties which was sold at Toyota Store locations alongside the Hilux. In North American markets the Hilux (known as the pickup) saw the use of four-wheel drive. It had a solid front axle and leaf suspension. The body saw a redesign that included single round headlights and a less complex body. This new 4WD setup featured a gear driven RF1A transfer case. This transfer case is unique in that its low-range reduction portion can be replicated, using what some refer to as a dual or triple transfer case. This results in a much lower overall gear ratio. It was the first Hilux available with an automatic transmission in that market. In 1981, a vehicle development agreement was established between Toyota, Winnebago Industries and two other aftermarket customisers. This was to allow Toyota to enter the SUV market in North America. The vehicles which resulted from this collaboration were the Trekker (Winnebago), Wolverine, and the Trailblazer (Griffith). All three used the Hilux 4×4 RV cab and chassis, and an all-fiberglass rear section (the Trailblazer had a steel bed with a fiberglass top). There were at least 1,500 Trekkers, 400 Trailblazers and an unknown number of Wolverines sold in North America. Research and development work on the Trekker led to the development of the 4Runner/Hilux Surf, which was introduced in 1984. Toward the end of the SR5's production run (1983½ model year), Toyota introduced the luxury Mojave for the US market as a limited-production (3,500 units) model with options not available on any other Toyota pickup. With a list price of US$8,308, it had bucket seats, two-speaker multiplex radio, chrome front and rear bumpers, and deleted Toyota logos on either the grille or the tailgate. Cruise control, power steering, and air conditioning were optional. It was powered by the SR5's standard 2.4 L (150 cu in) inline four. In Thailand, this model was sold as the Toyota Hilux Super Star. The August 1983 redesign (sold as model year 1984 vehicles in North America) introduced the Xtracab extended cab option, with six inches of space behind the seat for in-cab storage. These "1984" models carried over the carbureted 22R engine while model year 1984 also saw the introduction of the fuel injected 22R-E engine. Two diesel engines were also offered, the 2L and the turbocharged 2L-T. The engines were discontinued in the U.S. after the 1986 model year, this was due to higher performance expectations from customers and the wide availability of inexpensive gasoline. The next year saw the introduction of a turbocharged option, the 22R-TE, perhaps due to increasing competition from Nissan who already offered a V6 truck at this time. The solid front axle was swapped out for an independent front suspension/torsion bar setup in the 4×4 model in 1986, and optional automatic differential disconnect for the front differential (an alternative to automatic locking hubs) and an electronic transfer case was added as well. 1985 was the only year that it could be bought with a solid front axle and the 22RE fuel injected motor. Solid front axles had been present in all 4x4 Toyota models until 1986. In late 1986 for the 1987 model year, the truck went through a minor interior and exterior redesign, that included a new grille, a new 1 piece front bumper, an updated interior with full high door panels with faux leather stitching on the base and DLX models, the gauge cluster surround was more rounded and featured faux leather stitching on it, the dash pad featured a shorter tray than earlier models, the steering wheels were changed from black to gray, red, brown, or blue depending on the interior color, the radio bezel was also color matched to the rest of the interior, the SR-5 tach gauge clusters had the pattern on the face changed from a grid pattern to horizontal lines, the outside door mirrors were also changed to have a more stream lined appearance, the faceplate for the heater controls was also redesigned. A V6 engine was introduced in 1988. The Hilux-based 4Runner which made its entry in Australia, North America and the United Kingdom was based on this generation of the Hilux; in some other markets, such as Japan, it was called the Hilux Surf. Toyota introduced a new generation of the Hilux in most markets in late 1988 but the fourth generation remained in production until 1997 in South Africa. The company quoted that this was due to South African "content laws" which made it cheaper to continue the production of the fourth generation of the Hilux, rather than to retool the plant for the fifth generation model. In Thailand, this generation was sold as the Toyota Hilux Hero. The next redesign, in 1988, introduced a longer-wheelbase option, 3,099 mm (122 in) rather than 2,616 mm (103 in) for the regular wheelbase. Its one-piece cargo-box walls eliminated the rust-prone seams that were found in earlier models. The V6 Xtracab SR5 earned Motor Trend magazine's Truck of the Year award that year. The Xtra Cabs now featured more room behind the front seats than the last generation which allowed optional jump-seats for rear passengers, a feature more in line with competitors of the time. In 1991, North American production began at the NUMMI plant in Fremont, California (the VIN on these trucks starts with '4T'), however some trucks sold in the United States during the 1991–1995 model years were still manufactured in Japan (VIN starts with 'JT'). The Hilux received a minor facelift in 1991 (for the 1992 model year), which was a minor grille change and the new Toyota emblem that had been recently adopted. It was during this generation that Toyota discontinued the Hilux in the United States, replacing it with the new Tacoma for the 1995 model year. Volkswagen built and marketed the Hilux under the Volkswagen Taro name from February 1989 to March 1997. This generation of the Hilux sold in Thailand as the Toyota Hilux Mighty-X. The Hilux received a minor design update for the 1999 model year and the addition of a few more engine options. The Hilux was the facelifted in 2001 for the 2002 model year. In 2005, Toyota ceased production of the Hilux truck for the Japanese market. This was the last generation of the Hilux to be built in Japan. Toyota introduced a mid-size SUV variant of the Hilux in 1998. The variant called the Sport Rider is a rare model, sold in a select few Asian markets, including Thailand and Nepal. Based on the Hilux, both in style and underpinnings, it is similar in concept to the Toyota 4Runner—however, the Sport Rider is not a rebadged 4Runner. The Sport Rider's frame and suspension system are derived from the Hilux, including the Hilux's independent front suspension and leaf-sprung rear. The model started out as the four-door pickup truck, but was modified into wagons on arrival in Thailand by Thai Auto Works Co (a majority Thai-owned company in which Toyota has a 20 percent stake). The vehicles were distributed by Toyota Tsusho Thailand, the importer of Toyota forklifts. Engine options for the Sport Rider included the 5L engine for the Prerunner (2WD) model and 5L-E for 4WD models. Later 1KZ-TE engine was introduced for the 2001 4WD models which had foglamp integrated in the front bumper, 2002 saw the arrival of new engines—the 1KD-FTV engine for 4WD models and 2KD-FTV for the Prerunner (2WD) model with a new front bumper, new projector-style headlights, and new rear lamps. Toyota discontinued the Sport Rider in 2004, and replaced it in 2005 with the Toyota Fortuner. The seventh generation of the Hilux (designated the AN10/AN20/AN30), part of the IMV program, started production in Thailand during August 2004. Three pickup truck body variants were initially produced: a two-door Single Cab (referred to by Toyota as IMV1), a two-door Xtra Cab (IMV2), and four-door Double Cab (IMV3). In September 2008, Toyota introduced the Smart Cab, a four-door with hidden rear suicide doors. The IMV program also spawned the Toyota Innova (AN40) minivan (IMV4) and Toyota Fortuner (AN50/AN60) SUV (IMV5). The similar Toyota Tacoma pickup truck, introduced in February 2004 for the 2005 model year, is based on the 4Runner chassis, while the AN10/AN20/AN30 Hilux is based on an revamped version of the ladder frame found on previous versions. 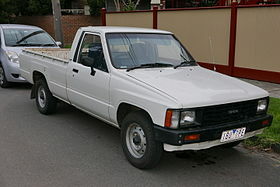 The Hilux increased in size and then became classified as a mid-size pick up. Hilux models sold in Asian, European, Middle Eastern, and Oceanian markets were initially built and assembled in Thailand. Later, production was delegated to Malaysia and South East Asia in order to increase sales in those regions. In Thailand, the vehicle is called the Hilux Vigo, or simply Vigo. For other European markets and South Africa, the Hilux was built in Durban, South Africa. As of December 2009, it is the best selling vehicle in South Africa. Those sold in South America were built in Argentina, as with the previous generation Hilux. However, the engines were built in Japan (where they are also used in the Land Cruiser Prado) instead of Argentina. In Malaysia, the Hilux was only available with a 2.5 L engine with the option of single cab or double cab body style. The double cab model has an automatic transmission. It uses the same engine as other Asian countries (in-line, 4-cylinder, 16-valve, DOHC Turbo Diesel with common rail direct injection), however engines used in Malaysia differ in their maximum output of 75 kW (102 PS; 101 hp) at 3,600 rpm and maximum torque of 260 N⋅m (192 lb⋅ft) at 1,600–2,400 rpm. In Singapore, the Hilux is available as a single cab with the 2.5 L engine or a double cab with the 3.0 L engine. Notable fleet customers include private taxi operators, for whom the double cab model offers additional load space versatility, and the Singapore Police Force, Pakistan Police Force, Syrian Police Force and the Royal Bhutan Police Force; all of which employ it as a patrol vehicle. This generation of the Hilux was introduced for Argentina on 2 March 2005 in Buenos Aires with a market launch in April. Two Hilux pickups were entered in recent years of the Dakar Rally by the Imperial Toyota team of South Africa. Driver Giniel de Villiers achieved third place in 2012, second place overall in 2013, 4th in 2014, and again second place in 2015. These however, were heavily modified non-production versions built around a custom racing-only tubular chassis and using a larger capacity Toyota V8 engine. This generation of the Hilux was also sold in Finland as the TruckMasters OX by Truck Masters Finland. Because of a modified rear suspension, the car is registered in Finland as a light truck. The OX is only available with a 3.0 D-4D diesel engine. 2005 3.0 L diesel D-4D DOHC I4, Turbodiesel, commonrail 16-valve direct injection, 121 kW (165 PS; 162 hp) (Asia, South Africa, South America, Australia, Europe). This version is made at Toyota's facility in Zárate, Argentina. A facelifted version of the Hilux was unveiled by Toyota's Malaysian distributors, UMW Toyota Motor, in August 2008. 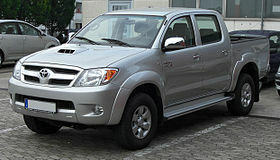 Toyota has introduced a left hand drive Hilux Vigo in August 2008 while a right hand drive facelifted model was introduced in September 2008. These facelifted models were introduced in the Philippines in October 2008. Toyota also introduced a four-door rear access system called "Smart Cab" to replace all Xtra Cab models in E and G grade. The Smart Cab models were developed in Thailand and were only sold in the Thai market. On 13 July 2011, Toyota announced that the Hilux would receive an upgrade, including a redesigned front end and other external styling changes, changes to the interior and a new turbocharged diesel engine capable of 107 kW (144 hp) and 343 N⋅m (253 lb⋅ft) of torque, as well as lower fuel consumption compared to the previous model. This update was initially launched in Thailand. The Hilux Vigo "Champ" was introduced in Thailand in August 2012 as a significant "minor change" with a new front design and a revamped interior to reinforce perceived luxury. The front was redesigned from the A pillar forwards. With the exception of the doors, roof and tailgate, everything else was new: new guards, new headlights, new bumper, new bonnet, new three-bar grille, new taillights, a new rear bumper, new models badge and other. There were also new mirrors and new alloy wheel designs. The interior features a new upper dashboard design with a new horizontal center instrument cluster. Perceived quality was improved through the adoption of uniformly darker finishes with greater color consistency throughout the interior. The high-end Double Cab version now came with a DVD player, rear camera and Bluetooth functionality. This minor update upgraded the emission standard to Euro 4, updated the four-speed automatic transmission to five-speed, upgraded performance of the 3.0-liter model from 122 to 128 kW (166 to 174 PS; 164 to 172 hp), increased torque from 343 to 360 N⋅m (253 to 266 ft⋅lb) for the five-speed automatic transmission, and the SmartCab Prerunner 4x2 was introduced with automatic transmission. Other changes included a more efficient fuel injection system and the addition of a center headrest on the rear double cab seat. The eighth generation of the Toyota Hilux was officially introduced simultaneously on 21 May 2015 in Bangkok, Thailand and Sydney, Australia. However, the pickup truck was available for sale in the showrooms from October, 5 months after its official introduction. The Thai, Laos, South East Asian and Cambodian market also adopted a new name, "Toyota Hilux Revo". The Hilux uses the "Keen Look" design language that has already been used on the Toyota Corolla (E170) with slim projector headlights and LED DRL (Daytime Running Lights). This design continues into the interior with similar AC vents and center fascia design. This generation has Toyota's first autonomous emergency braking (AEB). New ESTEC GD 2.4-litre, 2.8-litre and KD 2.5-litre along with 3.0-litre diesel engines, shared with the Fortuner and Innova, were combined with a 5 or 6-speed manual transmission or a 5 or 6-speed automatic transmission with sequential shift technology respectively. The 2.8-liter GD engine was introduced in May 2015 at the 36th International Vienna Motor Symposium. The 2.0-litre, 2.7-litre and 4.0-litre petrol engines from the previous generation returned with a Dual VVT-i update for increased power and torque. In 2019 Toyota revealed plans to introduce an EV HiLux within six years. Like the previous generation, this generation has also been sold as the TruckMasters OX in Finland by Truck Masters Finland since 2017. The modified suspension means that the truck is registered as a light truck in Finland, leading to lower taxes. The Hilux was re-introduced in Japan on 12 September 2017, after 13 years of hiatus. For the Japanese market, the Hilux is imported from Thailand. The facelifted Hilux Revo was unveiled at the 34th Thailand International Motor Expo on 30 November 2017. It features a new big front grille styling similar to the North American market Toyota Tacoma and a new front bumper with LED fog lights. A new variant was introduced in the Thailand market called the "Hilux Revo Rocco". The Rocco has a grey rear bumper bar, 18-inch alloy wheels with all-terrain tyres, a black sports bar with bed liner, Rocco insignia, gloss black grille, black metallic trim on the interior along with a redesigned instrument cluster. The Engine and safety features for the Rocco remain unchanged. The facelifted model was introduced in Malaysia as Hilux L-Edition in 2018. In the Philippines, the facelift model was introduced in February 2018. This facelift model is only available for the new top-of-the-line 'Conquest' variant. The Hilux has gained a reputation for exceptional sturdiness and reliability during sustained heavy use or even abuse. This reputation was highlighted in several episodes of the BBC motoring show Top Gear. In series 3, episodes 5 and 6, a 1988 diesel N50 Hilux with 305,775 km (190,000 mi) on the odometer was subjected to extraordinary abuse including being left on a beach for the incoming tide, left on top of a building as it was demolished and being set on fire. The Hilux suffered severe structural damage, but was still running after being repaired with only the typical tools that would be found in a truck's toolbox. This Hilux became one of the background decorations in the Top Gear studio. In the later series 8, episode 3, a Hilux was chosen by Jeremy Clarkson as his platform for creating an amphibious vehicle, and in the Top Gear: Polar Special Clarkson and James May raced a specially modified 2007 model Hilux to the magnetic north pole from Northern Canada – making the truck the first motor vehicle to make it to the magnetic north pole. The camera crew's vehicle from this episode was later modified and driven to near the summit of the Eyjafjallajökull erupting Icelandic volcano by James May in Series 15, Episode 1. In 1999, the Hilux appeared in a series of "Bugger" television adverts in New Zealand and Australia. The adverts were banned in New Zealand after receiving 120 complaints but later reinstated. A world record was achieved by the support crew for the participants in the 2008/2009 Amundsen Omega 3 South Pole Race. The crew travelled in specially adapted Toyota Hiluxes modified by Arctic Trucks, completing a trip of over 5,000 km (3,100 mi) from Novo, a Russian Scientific Station in Antarctica to the Geographic South Pole and back again, making them the first 4×4s to reach the South Pole. The return journey of 2,500 km (1,600 mi) from the South Pole to Novo Station was completed in a record 8 days and 17 hours. Despite being discontinued in Japan prior to 2017, the Hilux has been popularly grey-imported throughout private importers. This, along with the existing Hilux users' requests, demanded Toyota to revive Hilux in Japan after 13 years since discontinuation. Due to its durability and reliability, the Toyota Hilux, along with the larger Toyota Land Cruiser, has become popular among militant groups in war-torn regions as a technical. According to terrorism analyst Andrew Exum, the Hilux is "the vehicular equivalent of the AK-47. It's ubiquitous to insurgent warfare." U.S. counter-terror officials have inquired with Toyota how the Salafi jihadist extremist group Islamic State of Iraq and the Levant has apparently acquired large numbers of Toyota Hiluxes and Land Cruisers. Mark Wallace, the CEO of the Counter Extremism Project said, "Regrettably, the Toyota Land Cruiser and Hilux have effectively become almost part of the ISIS brand." The 1980s Toyota War between Libya and Chad was so named because of the heavy, very successful use of Hilux trucks as technicals. ^ ブリスカ [Briska] (in Japanese). 日野自動車・車図鑑 [Hino Motors, Image Gallery]. 29 November 2009. Archived from the original on 20 May 2013. Retrieved 22 May 2012. ^ a b c d "1st to 4th generation Hilux Chief Engineers | Hilux 50th Anniversary Special Website" (Press release). Toyota. 21 May 2018. Retrieved 28 January 2019. ^ a b c d "Toyota Announces Full Model Change in Hi-Lux SmallL Pick-up Truck Series" (Press release). Toyota. 1 September 1978. Retrieved 28 January 2019. ^ a b c d e f g h i j "Toyota Vehicle Identification Manual". Toyota Motor Sale Co., Ltd. – Export Parts Department. 1984. 97913-84. ^ a b Ruiz, Marco (1986). 'The Complete History of the Japanese Car: 1907 to the Present. Rome: ERVIN srl. p. 166. ISBN 0-517-61777-3. ^ Wright, Cedric, ed. (September 1978). "Toyota Hi-Lux 2000 Automatic". CAR. Vol. 22 no. 78. South Africa: Ramsay, Son & Parker (Pty) ltd. pp. 76–77. ^ "自動車ガイドブック: Japanese motor vehicles guide book" (in Japanese). 20. Japan: Japan Automobile Manufacturers Association. 30 October 1973: 227. ^ "Tahara Plant". Toyota Motor Corporation. 2012. Retrieved 18 July 2014. ^ a b c "自動車ガイドブック [Japanese Motor Vehicles Guide Book]" (in Japanese). 25. Japan: Japan Automobile Manufacturers Association. 10 October 1978: 109. 0053-780025-3400. ^ Marlin Crawler. "Dual Case Setup". Archived from the original on 28 January 2013. Retrieved 9 April 2011. ^ a b c d e "Pickups and Mini-Trucks". Pickups and Mini-Trucks. Hot Rod Magazine. 1 (5): 36. 1983. ^ McCamish, Brian. "Hilux 1984–1988". Brian894x4.com. Retrieved 22 May 2012. ^ "Shigeo Asai, Chief Engineer for the 5th generation Hilux | Hilux 50th Anniversary Special Website" (Press release). Toyota. 25 September 2018. Retrieved 28 January 2019. ^ Inama, John (24 November 2015). "Old vs. New: 1995 Toyota Tacoma vs. 2016 Toyota Tacoma". The Fast Lane Truck. Retrieved 1 September 2016. ^ Mastrostefano, Raffaele, ed. (1990). Quattroruote: Tutte le Auto del Mondo 1990 (in Italian). Milano: Editoriale Domus S.p.A. p. 1332. ^ "Masaaki Ishiko, Chief Engineer for the 6th generation Hilux | Hilux 50th Anniversary Special Website" (Press release). Toyota. 26 July 2018. Retrieved 28 January 2019. ^ "Detailed Specs of Thailand-made Hilux Tiger 1998–2004". ^ a b c d e f g h i j k "Toyota IMV Sales Reach Global 5 Million-unit Mark" (Press release). Toyota Motor Corporation. 6 April 2012. Retrieved 30 December 2015. ^ "Toyota rumo ao topo do mundo" [Toyota towards the top of the world] (in Portuguese). Istoé Dinheiro. 16 March 2005. Archived from the original on 30 December 2015. ^ "Malaysian Market: Production Volume Rises to 500,000-unit Level; Forecast to Reach 600,000 by End of Decade". MarkLines. 7 June 2005. Archived from the original on 30 December 2015. ^ "Kereta CKD Malaysia" [Malaysia CKD cars] (in Malay). ArenaKereta. 12 October 2013. Archived from the original on 27 August 2014. ^ "Company profile". Indus Motors Company. Archived from the original on 7 February 2015. ^ Young, Angelo (19 August 2013). "About 30,000 South Africa Auto Workers Walk Off The Job; Toyota, GM, Ford Auto Exports Affected; BMW Strike Enters Second Week". International Business Times. Archived from the original on 30 December 2015. ^ Pettendy, Marton (17 October 2011). "Thai floods halt Aussie ute supplies". GoAuto. Retrieved 30 December 2015. ^ "Activities by Region, Latin America". Toyota Motor Corporation. 2012. Retrieved 30 December 2015. ^ "Overview of Overseas Production Affiliates, Latin America". Toyota Motor Corporation. 2012. Retrieved 30 December 2015. ^ "Kaoru Hosokawa, Chief Engineer for the 7th generation Hilux | Hilux 50th Anniversary Special Website" (Press release). Toyota. 25 May 2018. Retrieved 28 January 2019. ^ a b "IMV Project Production Vehicles". Toyota Motor Corporation. 2012. Retrieved 30 December 2015. ^ a b "Thailand: Planned Production Capacity in the Country Amounting to Roughly 2.6 Million a Year in 2015". MarkLines. 4 November 2008. Archived from the original on 30 December 2015. ^ "Toyota Argentina Unveils New Hilux Pickup" (Press release). Japan: Toyota Motor Corporation. 2 March 2005. Retrieved 2 May 2014. ^ "Toyota HiLux on the podium in Dakar rally" (Press release). Australia: Toyota. 18 January 2012. Retrieved 23 February 2015. ^ "TruckMasters OX nyt tarjous hintaan!". ^ The New TRD Hilux (sales brochure), Toyota Motor Corporation Australia Limited, April 2008. ^ "Official: Toyota Hilux pickup gets fresh skin, more power for 2012". Autoblog. 13 July 2011. Archived from the original on 13 July 2011. Retrieved 13 July 2011. ^ "Toyota Hilux Vigo ::: Double Cab". Archived from the original on 11 August 2011. ^ "New Features in 2013 Toyota Hilux Vigo Champ" (Press release). Thailand: Jim's Autos Worldwide. Retrieved 4 October 2017. ^ "Hiroki Nakajima, Chief Engineer for the 8th generation Hilux | Hilux 50th Anniversary Special Website" (Press release). Toyota. 21 May 2018. Retrieved 28 January 2019. ^ "Masahiko Maeda, Chief Engineer for the 8th generation Hilux | Hilux 50th Anniversary Special Website" (Press release). Toyota. 21 March 2018. Retrieved 28 January 2019. ^ "LAN125L-DNMXEN - Hilux LHD 3.0L Diesel 6 seater". Toyota Gibraltar Stockholdings Ltd. Retrieved 8 August 2018. ^ Sze, Gregory (5 May 2015). "2016 Toyota Hilux pick-up slated for May 21 debut". Malaysia: PaulTan.org. Retrieved 5 May 2015. ^ Maric, Paul (23 April 2015). "2016 Toyota HiLux engine details leaked, ute to debut autonomous emergency braking". Car Advice. Australia. Retrieved 29 April 2015. ^ "2016 Toyota HiLux Revo Thailand". Thailand. 1 May 2015. Retrieved 1 May 2015. ^ "Programme – 36th International Vienna Motor Symposium – Congress Center Hofburg Vienna – Session: New Diesel Engines". OVK. Austria. 8 May 2015. Archived from the original on 22 February 2015. Retrieved 5 May 2015. ^ Maric, Paul (21 May 2015). "2016 Toyota Hilux details, October launch in Australia". Car Advice. Australia. Retrieved 21 May 2015. ^ Maric, Paul (29 April 2015). "2016 Toyota Hilux interior and exterior leaked". Car Advice. Australia. Retrieved 29 April 2015. ^ Hasham, Nicole (10 April 2019). "Toyota scuppers claim Labor's electric vehicle policy would leave HiLux drivers stranded". The Canberra Times. ^ "Täysin uusi TruckMasters OX Premium tulossa keväällä 2017" [Totally new TruckMasters OX Premium coming in autumn 2017] (in Finnish). Retrieved 21 August 2017. ^ "Toyota Reintroduces Hilux into Japanese Market after 13-year Hiatus, Land Cruiser Prado undergoes partial redesign and FJ Cruiser launches with special specifications". Toyota Global Newsroom (Press release). Japan. 12 September 2017. Retrieved 25 November 2017. ^ "2018 Toyota HiLux gets new top-spec 'Conquest' in the Philippines". autoindustriya.com. Philippines. 18 January 2018. Retrieved 23 September 2018. ^ a b c d e f g h i "Sales Report : ยอดขายกระบะ Pick-up ปี 2018 / 2561 : Toyota Hilux Revo ครองแชมป์อันดับ 1" [Sales Report: Pick-up pickup sales for 2018/2018: Toyota Hilux Revo occupies the # 1 spot]. Headlight Magazine (in Thai). Thailand. 22 January 2019. Retrieved 22 January 2019. ^ "Thailand cars sales report 2014". Headlight Magazine (in Thai). Thailand. Retrieved 24 October 2018. ^ "Thailand cars sales report 2015". Headlight Magazine (in Thai). Thailand. Retrieved 24 October 2018. ^ "Thailand cars sales report 2016". Headlight Magazine (in Thai). Thailand. Retrieved 24 October 2018. ^ "Thailand cars sales report 2017". Headlight Magazine (in Thai). Thailand. Retrieved 24 October 2018. ^ Bugger. New Zealand: Toyota. 1999. Retrieved 21 May 2017 – via YouTube. ^ Oastler, Mark (13 July 2012). "Bugger! Toyota's banned Hilux TV commercial". Truck Jungle. Retrieved 21 May 2017. ^ a b Somaiya, Ravi (14 October 2010). "Why Rebel Groups Love the Toyota Hilux". Newsweek. Retrieved 18 November 2015. ^ Mosk, Matthew; Ross, Brian; Hosenball, Alex (6 October 2015). "US Officials Ask How ISIS Got So Many Toyota Trucks". US: ABC News. Retrieved 18 November 2015. Wikimedia Commons has media related to Toyota HiLux.